You are currently browsing the Carpe DMM blog archives for April, 2015. In 2009 I went on a holiday to England and Wales with my wife. We hired a car from Heathrow Airport, and began our trip by driving directly away from London. The plan was to do a loop through Cornwall, up to Wales, then across and down to London via the Cotswolds. We hadn’t booked any accommodation in advance except for after we got to London, and we spent two weeks driving to wherever took our fancy and finding a place to stay for the night. After several days we ended up in Shrewsbury, just on the English side of the border with Wales. It’s a lovely city, with the famous Shrewsbury Abbey just across the river and outside the walls of the old medieval city. We liked it so much we stayed thee two nights, giving us time to spend an entire day walking around and absorbing the architecture and atmosphere. The weather was intermittently drizzly, and at one point in the early afternoon the rain got quite heavy. We took refuge in a cafe which served gelato, and spent half an hour or so sitting and eating the sweet treat. While sitting, I watched the people walking past outside. 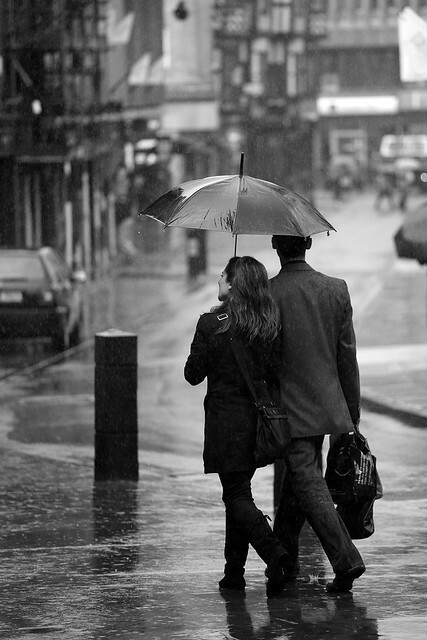 As this couple waked by, sharing an umbrella, I grabbed my camera and took this candid shot. I have no idea who these people are, but this is one of my favourite photos from that trip, as I feel it captures something about the couple, and the way they quietly work together to withstand the British drizzle. Whoever these two are, I hope they are still happy together. I took this photo in Venice, on my first trip to Italy in 2001. Venice is an amazing place. Sure, it’s hyped up, but for me it lived up to the hype and then some. It is pedestrian-oriented and there is something amazing and interesting around every corner of the maze-like warren of streets and canals. It buzzes with activity, but even though many of the people you see are tourists, there is a definite local atmosphere if you just head a few steps off the main tourist strips. Piazza San Marco (St Mark’s Square) is of course as far on the tourist strip as it’s possible to get, but this also makes it a colourful and fascinating place. It gleams at night with lights and people and sounds – it’s something to just immerse yourself in. I took my Canon T70 35mm film camera on this trip, with a small selection of lenses and a cheap aluminium tripod. I am very glad I took the tripod, because I took quite a few shots at night, requiring slow shutter speeds – this being one of them. Being film, I had to estimate the exposure with a bit of help from the camera’s light meter and then hope that the pictures turned out okay when I got home and had them developed. 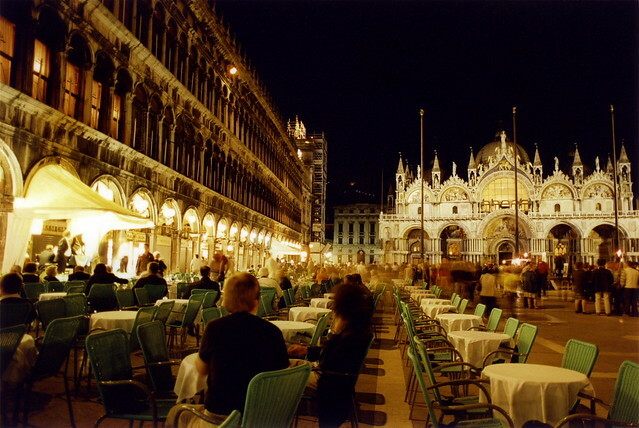 I set up behind the tables at this cafe, aiming at Basilica San Marco on the right, and the opera singer with small group of musicians on the cafe stage at left. The photo turned out better than I hoped. I like the blur of the moving people in the square, which adds some of that atmosphere of activity which you feel when really there. I scanned the digital image from a print of the negative. This is one of my most viewed photos online. A while back I was contacted by the Victorian Department of Education (from the Australian state of Victoria), who requested permission to reproduce this photo in an exam paper. Since it was for educational purposes, I granted them permission, and they sent me a copy of the paper. It appeared in a geography paper, with questions about the use of land and buildings in this area. This is not actually my favourite photo from that trip to Italy. Maybe I’ll tell the story of that one another day. I took this photo in January 2006, just a few hours after landing in Tokyo on my first visit to Japan. This was my first business trip with Canon Information Systems Research Australia, the company I’ve been working for ever since. Being a subsidiary of Canon, we have plenty of contact with the head office in Tokyo, and staff often take business trips over there. 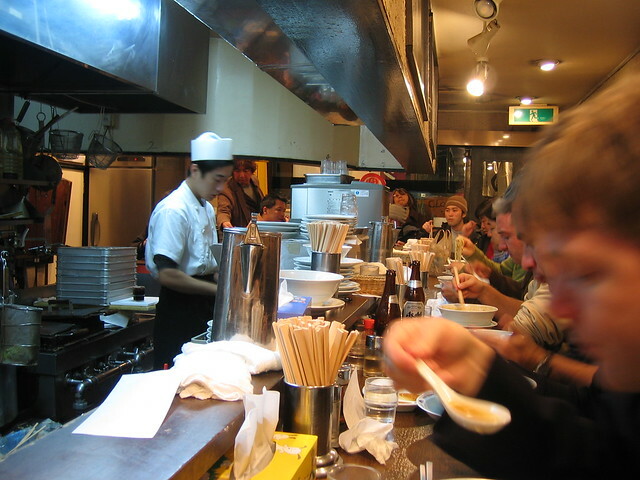 I was travelling with a co-worker (that’s him blurred on the right, holding the spoon) who had been to Tokyo before, so could rely on his experience in getting around, and in finding a place to eat on the night we arrived. Being January, it was very cold – much colder than I am used to even in midwinter at home. There was snow on the ground. We caught a shuttle bus from Narita Airport to Shinagawa, where our hotel was. After checking in, we were hungry and so ventured out to find a place to eat. I like the perspective lines in this photo, and the balance between blue and red light across the two halves of the image. The slight tilt and the blurring of the motion of some of the people give it a sense of motion and busy-ness which matches my impressions of that meal. That, and memories of the hustle and bustle on this first night in Tokyo make this one of my favourite photos from that short trip. This photo is a result of my quest this autumn to catch a great sunrise. Sunrises and sunsets can be beautiful and can make fantastic photos, but you have to catch them with the right weather conditions. And for really good sightlines and scenery, you can’t beat the sun rising or setting over water. The problem is, I live on the east coast of Australia. If you live on a western coast, you have the luxury of watching the sun set over water. You can have a leisurely day doing whatever you do, and judge the weather conditions to see if there will be a spectacular sunset, and then go photograph it at leisure. If you live on an eastern coast, you need to catch the sunrise. You need to wake up before dawn, peer outside to try to guess the weather conditions, then head out anyway because you can’t tell. You arrive at the coast in pitch blackness, while nearly everyone else is still asleep, and you hope that the sunrise will be worth it. And more often than not, the weather is cruel. The best time of year to do this peculiar form of self-torture is autumn, just before daylight saving ends. The weather is still warm enough for early mornings to not be freezing cold, and the late sunrise means you only have to get up around 5:30, rather than 4am or so in summer. This autumn, I’ve made five pre-dawn treks to various beaches, hoping for that elusive golden sunrise. Each time I’ve been more or less disappointed. I can still get some photos that I like and am proud of, and this photo is one from my most recent excursion, on 30 March. I think it turned out well, and is pretty good for the timing, which was about 20 minutes before sunrise. However, very soon after I took this photo, a storm rolled in from the south and thick cloud obscured that pink glow on the horizon. I never saw the actual sunrise at all, and I didn’t get the sort of photos I was really hoping for. But still, no photographic trip is a complete loss if you look at it the right way. 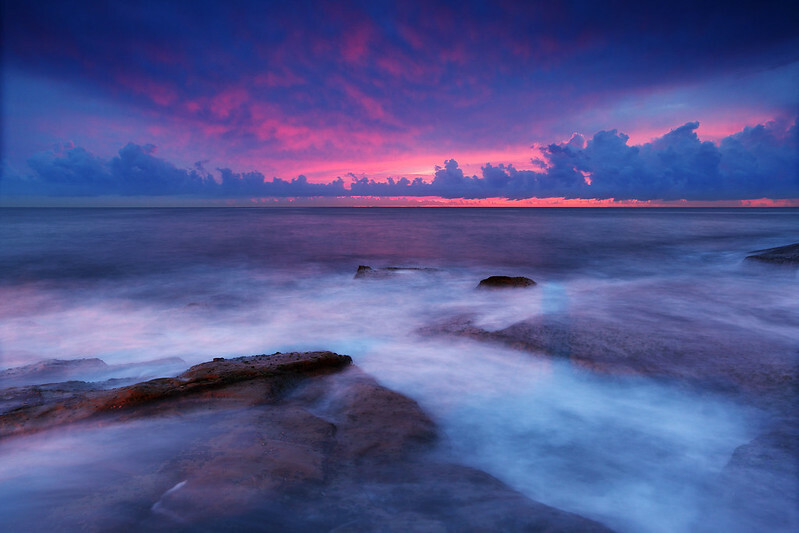 I still took some photos, of clouds and swirling ocean and wave-washed rocks. And I was up early and had the whole day to look forward to! I love cramming as much into a day as I can, so this was a good start. I’m feeling inspired to post a bit more often here on other topics, now that the long haul of my last trip diary is done. As a first step, I’ve edited all the entries for the Morocco/Spain trip to hide most of the material behind “click here to read more” tags, so the front page of this blog looks cleaner and less bulky. I thought something I could do would be to post the story behind some of my photos. So I plan to occasionally select one of my photos and explain some of the circumstances around where I was and what I was doing at the time, and what planning (if any) went into the photo. A sort of photoblog with background info.